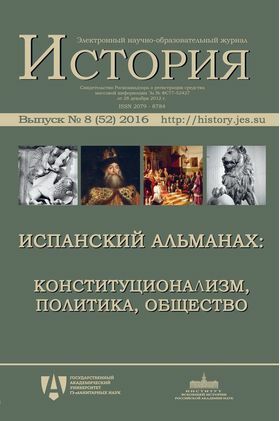 The main part of the issue that you have opened, represents the materials of the round table “Constitutionalism in Europe and America: the Legacy of the Past and Perspectives (200th Anniversary of the Cadiz Constitution of 1812)”, which was held at the Russian State Humanitarian University in the autumn of 2012 on the initiative of Igor Mednikov. As the round anniversary determined, the program included articles about the Cadiz Constitution of 1812 by itself, its role in the Spanish history of the 19th — the beginning of the 21st century and, in this regard, the Constitution of 1978, which has played such a significant role in the Modern history of Spain. However, the round table and, accordingly, the publication of its materials has two virtues that make this issue of the journal interesting not only for hispanists. Firstly, along with articles on the Cadiz constitution of 1812, its international context, a substantial group of reports is devoted to the constitutions of other countries and regions: Russia, USA, Latin America, Britain, France, Germany and Belgium — and partly to other periods, as chronologically articles cover not only the 19th century, but also the 20th and the beginning of the 21st century. Secondly, another noteworthy feature of the Cadiz Constitution and the related events is reflected in the materials of the round table: its special place in the history of Russia and Russian-Spanish relations. Various aspects of this connection are also investigated in several articles. In addition to the materials of the round table about constitutionalism, the current, third, issue of “The Spanish Almanac” also contains a collection of articles devoted to the history of Spain in the Middle Ages and Early Modern times. These works are devoted to different regions — Castile and León, the Crown of Aragón, the Emirate of Granada — and affect a wide range of issues, from domestic politics and the history of law to diplomacy and historiography. Some of the articles are related to the history of the embassy of Piotr Potiomkin to Spain in 1667—1668. Its 350th anniversary will be celebrated at the end of 2017 and in the beginning of 2018. Authors and editors hope that the issue of the journal will be of interest to readers.